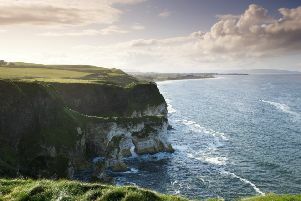 The new owner of land earmarked for a £100 million championship golf course and luxury hotel on the Causeway Coast is considering whether to push ahead with the plan. It has emerged that millionaire businessman Dr Peter FitzGerald has purchased the 350-acre site near Bushmills, following speculation that he was in the process of doing so last month. The land is part of a 1,200-acre estate bought by the founder of the Randox medical company. While the price paid has not been revealed, Tughans law firm, which announced the acquisition, said it was the single largest private property transaction in Northern Ireland this year “by a considerable margin”. Planning permission for the five-star golf resort had already been secured by late US-based businessman Dr Alistair Hanna before his death earlier this year. The consortium led by Belfast-born Dr Hanna ultimately did not complete the purchase of the site and it was put on the market six months ago. It has now been bought by Dr FitzGerald along with adjacent land including Dundarave House, a 19th century stately home with 19 bedrooms, a farm and shoot business. A statement from Tughans said: “The estate was bought by subsidiaries of Randox, the Crumlin-based medical analysis company. “The land includes 350 acres which secured planning permission earlier this year for a five-star 120-bedroom hotel and 18-hole championship links golf course. Fresh hope for the site comes just one month after it emerged that plans for the landmark golf resort had foundered and was in the process of being sold to an alternative buyer. Initially the resort proposal, which included a five-star hotel and 70 golf lodges, had attracted strong opposition. Environmentalists objected because of its proximity to the causeway, which is a UNESCO world heritage site. However, last year, the National Trust, which owns the Giant’s Causeway, failed in a legal challenge to block the Bushmills Dunes golf course plan. James Walker of Savills UK, the international real estate advisor who handled the sale, said: “The Dundarave Estate is a fine example of Northern Irish heritage – the sale of which attracted significant global interest. Records show the Dundarave Estate dates back more than 275 years.